Best new pizza spot in Brooklyn. Order the Colony and Emily and whatever special is on. 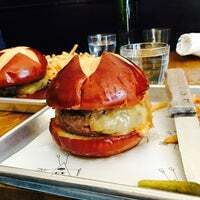 The burger on a pretzel roll is also the best in town right now. Sit at the bar, get great service and honest opinions about wine and beer on the menu (ask for a taste if unsure). The Colony Pizza is a favorite, while the chicken wings are a very messy, must have. 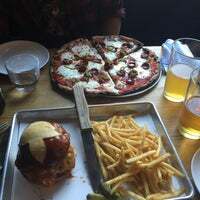 You must try the 1) vodka pizza with vodka sauce, ham, & mozzarella 2) emmy burger on a pretzel bun and the most magical of them all the 3) zucca pasta with duck ragu. Wonderful food and experience! Wow wow wow the special 🍕- butternut squash purée, kale, goat cheese, and guanciale - was top three best pizzas I've ever had in my life. I could eat it probably once a month for the rest of time. 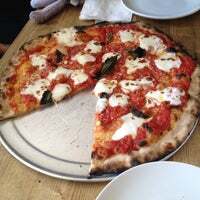 This is my favorite pizza in NYC. Get the Emily pizza (pistachio, truffle, honey); I'm usually not one for gourmet pizza but it's amazing! Love this place! 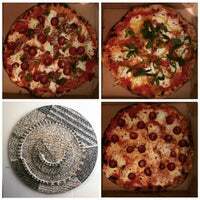 Order a pizza and an app or pasta for 2 ppl, two+ pizzas for any party larger than that. 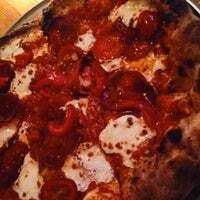 The Colonie with pepperoni, pickled chilis & honey is A++, as is the bucatini and the cheeses! Order a red & white to start. We went with a Colony (spicy/sweet!) and the special White of the day (fontina, mushrooms, etc). Both delicious! I'm heading back soon for the vodka and tomatillo pies! Still prefer the Detroit style pizza from the WV or WBurg locations but the Colony is always a go to! The burger is my favourite in NYC - juicy, a bit crunchy and delicious paired with a perfect bun. Bibb salad, Emily pie, and burger med rare. Fkn delicious. Love how this spot doesn't respond to special requests. Just eat the food they give u and shut up. You should get the Emily pie (white pie with honey) - complement it with a Rafa (peppers, onions, tomato sauce). New fave. Had us in and out in 30mins, but super cozy at the same time. 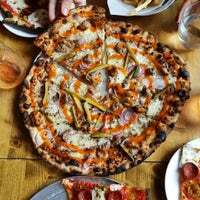 Pizza is incredible (thin crust, great toppings) - try the 'colony.' Burger is overhyped IMO (too creamy), so go with pizza! I'm no vegetarian but had a veg feast to die for: the crispy (and spicy w/ a little sweet) sprouts, the kale pesto spaghetti, and a Lady Pizza Girl, the tastiest mushroom white pizza I've ever had. Everything is sooo yummy. With the coziest vibe and friendliest owners this new spot is a gem. You MUST get the Emily pizza and sprouts of course. Their homemade mozzarella is out of this world! Emily pizza and Arn-Dog Jr were ri-friggin-diculous. Insane in the membrane. Brussel sprouts were also on point. Haven't had the burger but you can't go wrong. Get here early (before 6:30) for the infamous Emmy burger. They only sell 25 a night. Don't let it overshadow the pizzas, though. The Emily, the colony, and the vodka pie are great choices. It was love at first slice, yo. And then some, finished the whole pie. 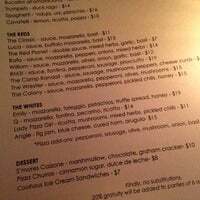 I would get the Colony (mozzarella, pepperoni, pickled chili, honey). Those two last ingredients make for a tantalizing mix. This is the best burger we have ever had; primarily due to the wonderful pretzel bun, onion, and the sauce that they put on top of the burger. Fries were well done; they were good! 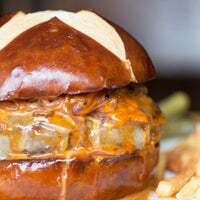 Although the pizza is solid, the can't-miss dish here is the Emmy Burger, a dry aged beef patty topped with cheddar, charred onions, and Emmy sauce sandwiched between two pretzel buns. In all seriousness, one of the best #burgers I've ever had. Phenomenal patty, delicious sauce, great bun! Loved the #fries too! Great pizza too! Flavors are big. The burger is tarted up with a bevy of reckless condiments, but could (and does) easily standalone as one of the best in town based on the quality of meat. Def get. The wet, cheese/onion adorned burger is everything you’ve heard, although $27 is a bit extreme. Pizza is quite good although sadly no square pies here. Meats spicy wings and charred sprouts also tops. Best pizza in my life. 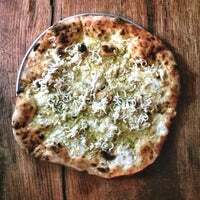 Burrata pie is divine and white pie options are savory. Ask waiter for tips on add ons and trust them. Wine list is priced moderately, plus plus. First time here? 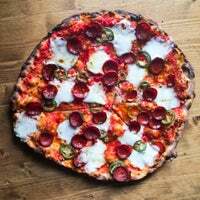 Try the Emily pizza for a perfect mix of savory with a bit of sweetness. One pizza + one appetizer is the perfect portion for two people to share. The perfect place to eat a meal alone: grab a seat at the bar, bring a book, order a glass of Malbec, the arugula salad, and the Lady Pizza Girl and you have a perfect night. Pizza does love Emily! And so do I. 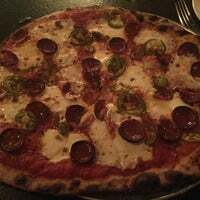 Definitely my favorite pizza in the area, and my go-to for a nice night out. I recommend the Luca, the Baby Q, and the Lady Pizza Girl, but there's no bad choice. Loved the Pizza and the Gin Tonic. Love how the Pizzas are stacked on the table. Even though food-wise I would go back to Emily's anytime unfortunately the music was soo loud we couldn't talk at all. I said I wouldn’t get the burger because it’s $27 which is stupid. But I got the burger and it’s kinda worth it. You’re gonna spend that money anyway, right? Lady Pizza Girl is 👍. Unfortunately, had a party of 7 for my bday and did not receive the nicest treatment from the dream team, Emily and Matthew. Waitstaff was great. The pizza toppings were creative and the pizza delicious. I especially loved the Quinn. I would also recommend their second restaurant Emmy Squares, which is even better! The Colony & Emily pizzas are awesome. 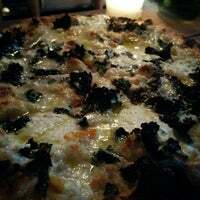 Vodka pizza is only ok and the burrata pizza is a definite pass (there's hardly any burrata on it). Burger is great too. Go here. 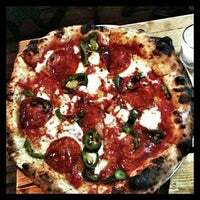 Get the Colony (sauce, peppers, pepperoni, and honey) and the PXG (tomatillo sauce and 'nduja sausage). Give Emily a hug. Don't talk to me until you do. 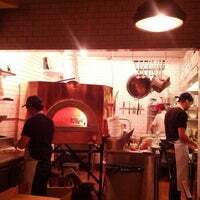 Pizza and American dishes from a wood burning oven. "If you love mushroom get the Funghitown. 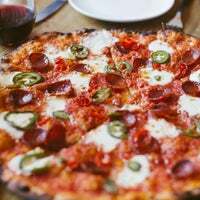 Love the super crispy crust of all the pizzas." 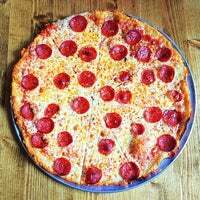 "Never had a detroit style pizza before but the one I had here was excellent. Thick and crispy crust. Perfect for someone who loves bread." "Try the Calzone - カルツォーネうまい＼(^o^)／NYで初めて出会ったまともなピザ(^_^;)"
"All of it. But will highlight octopus, wings, all of the pizzas (try the Margherita + fennel sausage) and steak. You really can’t go wrong here." "Butter pecan brittle and the pistachio pistachio brittle! "I'm in love again" :-)"
"The Tux is a great alternative to a Manhattan, but they do the classics too! (get it perfect with a twist, and your rye of choice)"
"Spicy shrimp and grits with chorizo is great - will be even better when the weather gets colder!"